Follow the steps and make your own Gesture recognition successful. Gesture is simply the user interaction with the screen. So, let’s start to recognize these gestures. 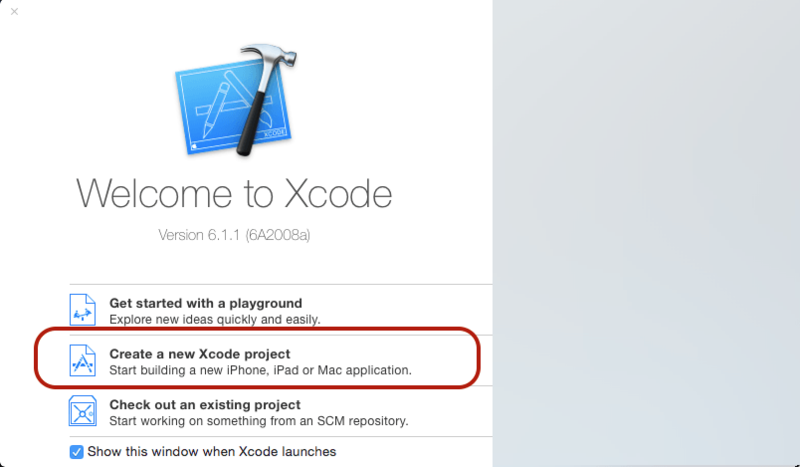 Xcode’s latest version is an IDE which is used to create all the apps using Swift Language but it requires platform OS X latest version to be installed. 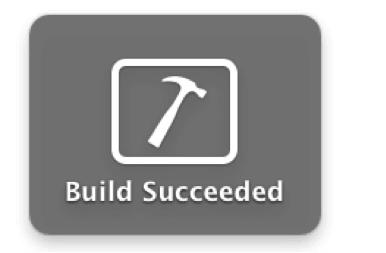 Now, open Xcode Project. 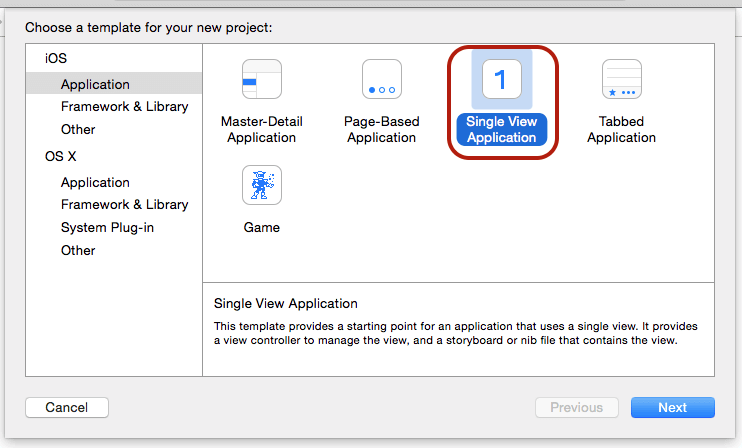 Now, select the Single View Application option and press on the next button. The above screen contains some fields. User must provide information in all the fields, Set app name GestureRecognizer or whatever you need to give and click on next. Here, Language of the project to be selected must be Swift for Swift language and so on. Choose your project path and Press on Create to create project. Here, select your project. The main files that you’ll be able to see in your application are as shown below. Using these files you can implement any functionality. Now, create a layout for Gesture Recognizer which is shown below. Put a simple view at the center of the screen and make connection with ViewController.swift file. @IBOutlet weak var vwBox: UIView! Now, for gesture recognition, use X & Y position of UIView whose name is vwBox. 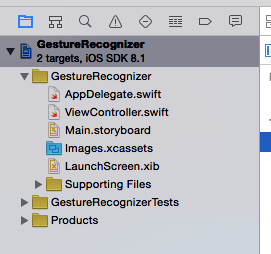 Here, tapGesture variable is made with type UITapGestureRecognizer and give its target to self. Action selector method name recognizeTapGesture is used to handle tap and perform some actions on view or any functionality made in app. Here, in function recognizeTapGesture code is used to change the view background color which you have set on the tap gesture recognition. You can apply your own logic for this method. You can check this gesture by simply clicking on that view. Second gesture recoginzer is LongPressedGesture for which the same method is used initializeGestureRecognizer(). Here, longPressedGesture variable is made with type UILongPressGestureRecognizer and give its target to self. Action Selector method name recognizeLongPressedGesture is used to handle long press and perform some actions on view or any functionality made in the app. Here, in function recognizelongPressedGesture code is used to change the view background color which you have set on long pressed gesture recognization. You can put any logic on your own for this method. You can test this gesture by long clicking on the view. 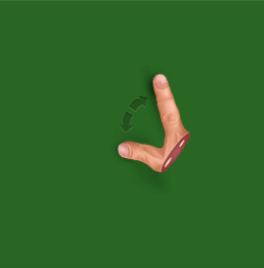 Here, rotateGesture variable is made with type UIRotationGestureRecognizer and give its target to self. Action Selector method name recognizeRotateGesture is used to handle rotation and perform some actions on view or any other functionality made in the app. Here, in this function recognizeRotateGesture code is used to rotate the view which you have set on rotate gesture recognition. You can apply any logic of your own for this method. You can test this gesture by pressing option key and rotate view using the mouse. Here, pinchGesture variable is used with type UIPinchGestureRecognizer and give its target to self. 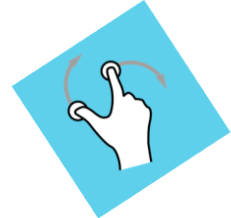 Action Selector method named recognizePinchGesture is used to handle pinch and perform some actions on view or any other functionality made in the app. Here, in function recognizePinchGesture code is used to put pinch in the view which you have set on pinch gesture recognition. You can apply logic of your choice for this method. 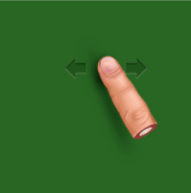 You can test this gesture by pressing the option key and then pinching the view (Zoom in / Zoom out) using the mouse. Our fifth gesture recognizer is Pan gesture for which the same method initializeGestureRecognizer() is used. Here, panGesture variable is used with type UIPanGestureRecognizer and give its target to self. Action Selector method is created named recognizePanGesture to handle pan or moving activity and perform some actions on view or any other functionality made in the app. Here, by default maximum & minimum number of touches is 1 for pan (moving object) gestures. Here, in function recognizePanGesture code is used for pan or moving the view which you have set on pan gesture recognition. You can apply your logic for this method. 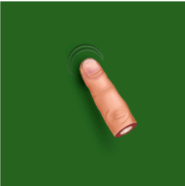 You can test this gesture by clicking on the object and then moving it around. Now, build the App (cmd + b) & Run (cmd + r). Finally, your all 5 gestures are now recognized on the view. You can test all the 5 gestures at a time on the screen. 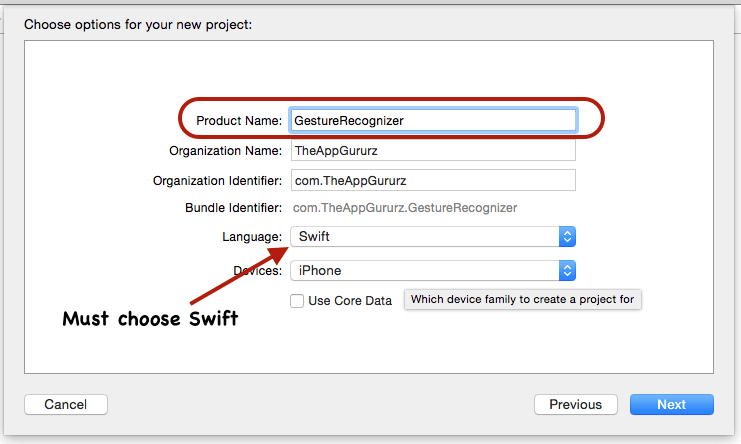 I hope you find this blog very helpful while working with Gesture Recognizer using Swift. 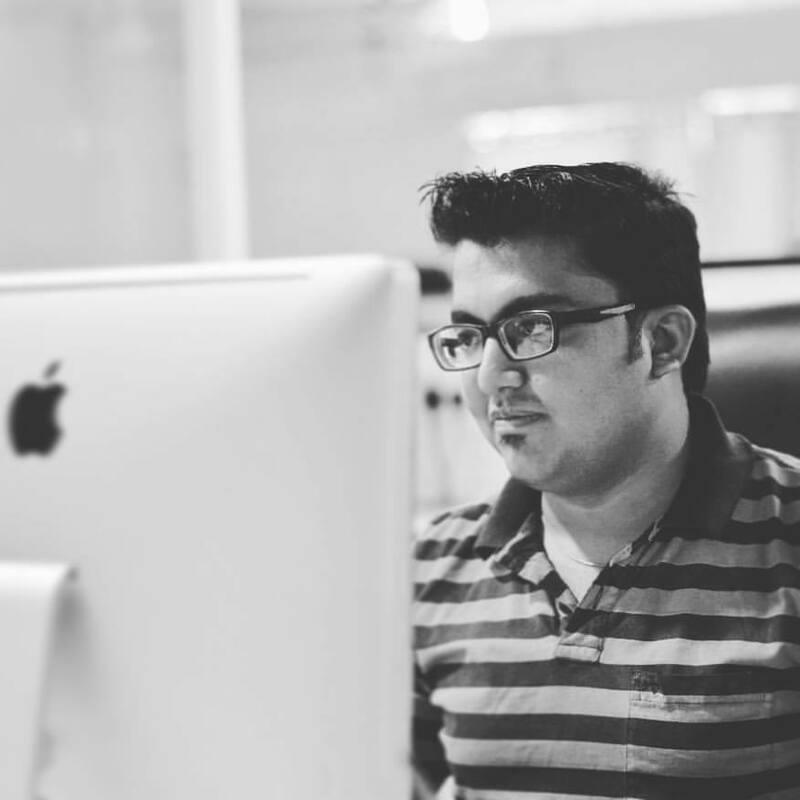 Let me know in comment if you have any question regarding swift. I will reply you ASAP.